We are proud to be entering our sixtieth year as a family owned and operated business dedicated to filling your most demanding graphic arts requirements. Our Mission: To meet or exceed our customers' expectations - every time. This version (June 2006) of the web site includes several new product offerings. There has been a complete revamping of the PANTONE color line. We have also added several PEAK magnifiers that had to be special ordered in the past. There are also three very popular, surprisingly well-made, and economically priced CARSON magnifiers in addition to a new line of ECONOMY headband magnifiers. Those of you that liked the 650 Digital Mini Gauge will want to look at the new 651. This version also includes our latest prices. Arthur H. Gaebel, Inc. was formed in 1946 primarily to serve the newspaper industry. Our only products in those early days were stainless steel rulers and printers line gauges. 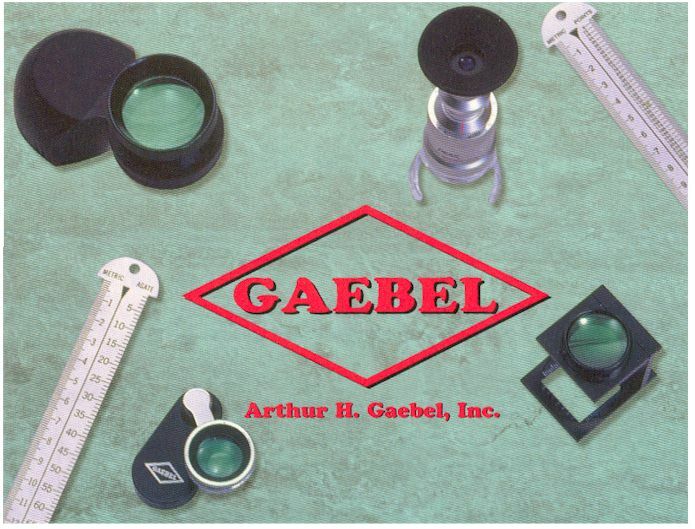 Today, some 60 years later, we have evolved into a full service company supplying both the fine arts and the graphic arts industries with our own line of precision rulers as well as an extensive inventory of magnifiers, loupes, drafting equipment, microscopes, paper gauges, and an impressive array of useful tools and supplies. Headquartered in East Syracuse, New York, we have a network of dealers throughout the United States, Canada, Mexico, and many other countries worldwide. To place an order, please contact us and we will help you find one of our dealers that can best meet your needs. If there is no dealer in your area, we will fill your order directly. We appreciate your interest in our products and will do our very best to serve your requirements. We invite you to browse through the categories below to see the wide variety of graphic arts supplies that we offer. If you do not find what you want, please give us a call or send email - details on our Contact page. To further help you find the items you need, we have added a Search page as well as an Index. At this time of year, you may be thinking of promotional items as gifts or as the economy picks up, you may want to use a promotional item to build new sales for 2006. See our newly added page on Imprinted & Promotional Items. We periodically send out an email notice on new items and monthly specials. Please send your name and email address to us at info@gaebel.com to be added to this list.